I really had trouble naming this post you guys. There were SO MANY OPTIONS. 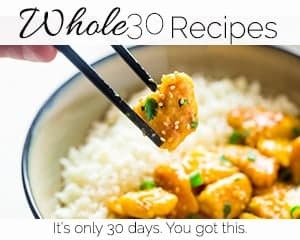 I mean, I went with the title of this recipe because I didn’t want you to think it was a recipe-less Friday, start reading and then – WHAM – SURPRISE INSIDE recipe hits you right in the taste buds. I need to prepare you in ADVANCE for something so stupid-easy and stupid-delicious. Which, I sort of thought would only make sense in MY brain, and you would just be really confused. <– I’m right aren’t I? You’re already confused just by reading it in a sentence. I KNOW YOU. 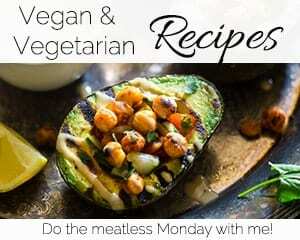 Don’t worry the post you’re about to read will not self-destruct in 5 seconds, but it IS packed with SO MUCH DELICIOUS PROTEIN GOODNESS that your muscles are going to EXPLODE out of your body just by reading it. Could be a slight exaggeration. But, minor details. You guys know “The Vitamin Shoppe” yes? If not, you will today. 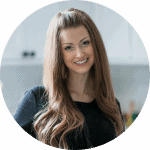 They carry all sorts of fitness and nutrition related goodies, but today I want to talk about their new category that is being launched in nearly 700 stores and ONLINE: PROTEIN PANTRY. AKA: my most favorite kind of pantry ever. You guys know my ridiculous obsession with protein. No lies. 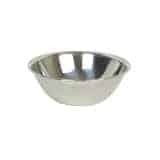 Every meal I ask. He’s a slow learner that “cereal by itself is not a meal” but he’s coming around guys. BUT NOW he can just eat some protein pancakes and CALL HIMSELF JACKED UP. Which he likes. You know how men get about being big and muscley and BUFFBUFFBUFF. Protein infused nut butters – 3 different brands (Buff Bake, P28 and D’s Naturals) and 3 different flavors! I am currently wishing that nut butter was a food group. I would much rather eat White Chocolate Protein Peanut Butter, Snickerdoodle Protein Almond Spread or Maple Vanilla Protein Almond Butter over roasted broccoli. 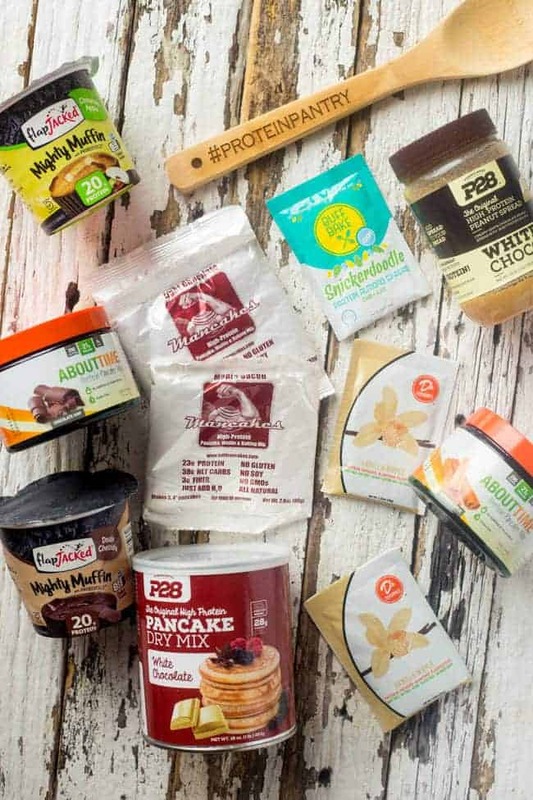 Some more About Time protein pancake mix and 2 new ones I have yet to try from P28 and Mancakes – White chocolate, Light Chocolate and Buttermilk! I already know I will obsess it though. Like all things gluten free pancake and chocolate. It’s just how my taste buds work. 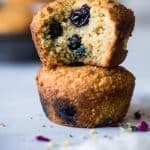 Microwave Muffins from FlapJacked (fun name alert!) 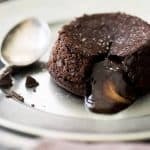 Who knew something so tasty and protein-packed could come in a little cardboard container and be ready in 30 SECONDS?! I MAY NEVER HAVE TO COOK AGAIN. Just kidding. Then FFF would not exist. BUT YOU KNOW WHAT I MEAN. 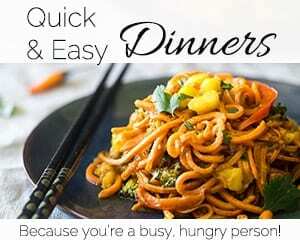 I hesitate to call it a recipe without “” because it’s SOSOSOSOSO easy. 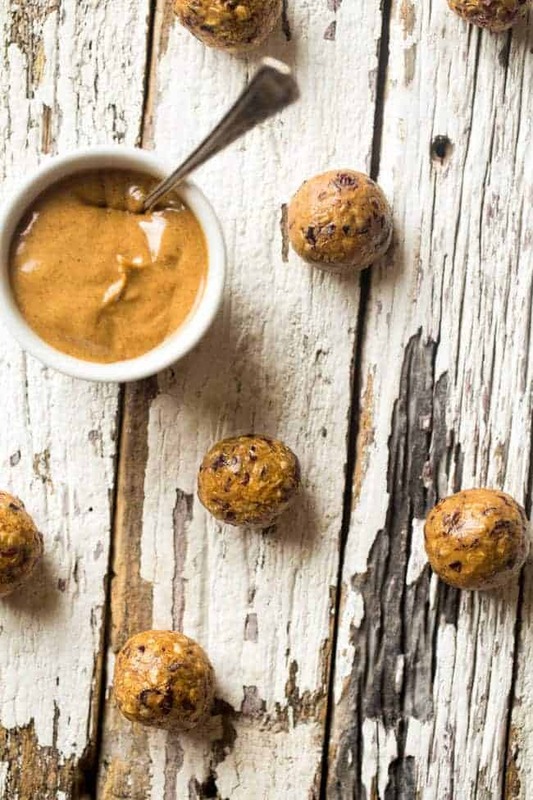 But, you guys have been asking for super quick and simple snacks so HELLO ENERGY BALLS. I chose to use D’s Naturals Vanilla Maple Protein Infused Almond Fluffbutter because it’s October. Which means maple? ALL DAY LONG SWEET THANG. Was that weird? Not sure. What I’m trying to say is these bites, with their creamy, sweet maple-y notes, chewy cranberries and crunchy, roasty-toast pecans, just HIT you in the face with FALL. Plus oats. Which should be eaten every season multiple times a day if you ask me. I actually think that my blood is not actually made of oxygen guys. Just oatmeal and almond butter. Only 4 ingredients? CHECK. Ready in about 3 minutes? 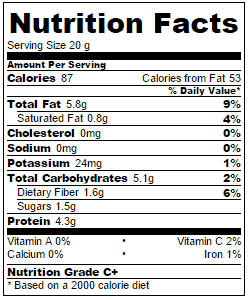 Perfect blend of carbs, fat and protein? UHHUHUHHUHUHHUH. 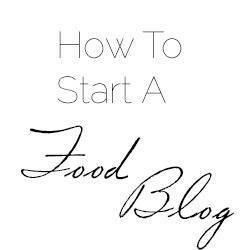 BUT, if you’re one of those people that doesn’t like almond butter? (That’s weird.) 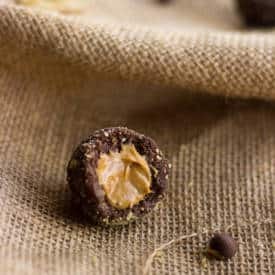 Then make sure you check out these No Bake Chocolate Peanut Butter Coconut Energy Bites from Beaming Baker! I know you can roll with DAT. PUNNY. 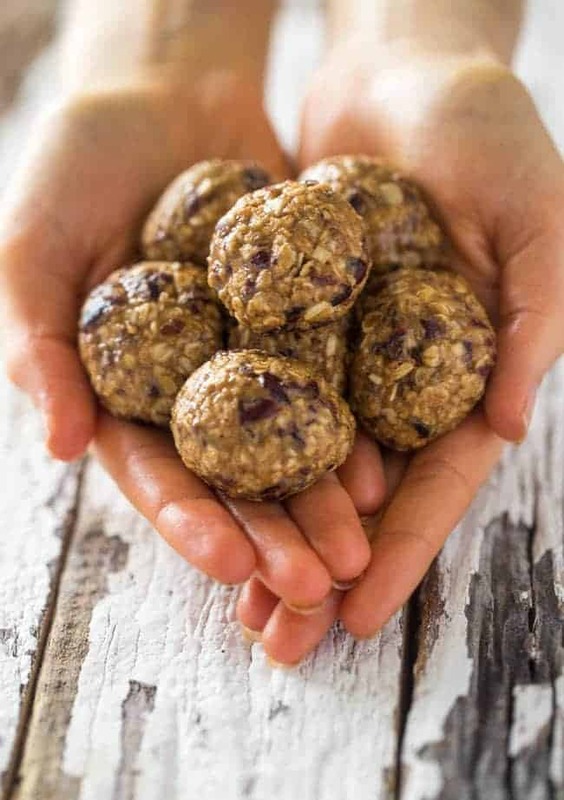 These energy balls are made in 5 minutes and use only 4 ingredients: maple vanilla almond butter, oatmeal, cranberries and pecans. 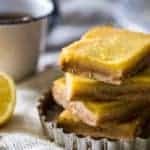 They're an easy, gluten free, healthy and vegan snack or breakfast! Roll into balls and DEVOUR! 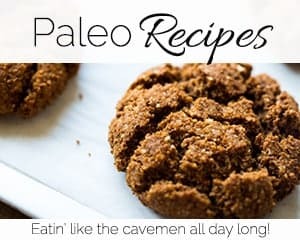 These energy bites sound amazing, Taylor! I’m loving that they’re only four ingredients. The addition of almond butter sound just perfect. 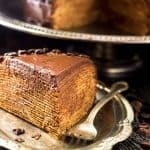 I have a feeling I would devour this entire batch! Pinned! I had a hard time not eating them all in one go! Thanks Gayle – happy Friday! NOT AT ALL. I’m well on my way! 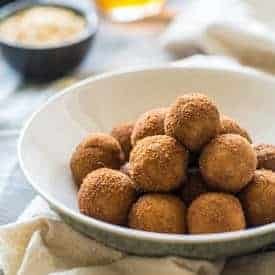 I love energy balls. they are always the best treat!! You had me at 4 ingredients. SOLD. Plus I just love bites oh so much. Happy Friday! Aren’t they so fun to much?! Happy Friday to you too girl! Thanks! Love nut butters, so the fact that you can get them with proten powder–hello, new love! Isn’t it AWESOME! Totally love it! Thanks Kristen! 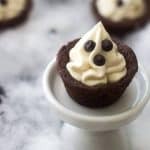 Holy cow these are so easy to make! Perfect for a little afternoon snack or right before a workout! YES! Exactly: Workout snack PERFECTION! Thanks Bethany! OMG IT IS SO GOOD GIRL!! Thanks! I’m down for anything with the word “jackpot” in the title. Ha ha. These look amazing, Taylor and I could definitely use an energy boost right about now! 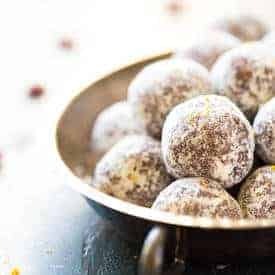 These energy balls sound amazing! I love the combo of cranberry + maple! Perfect for this time of year! Haha, right?! It can be so challenging!! Thanks girl, I hope you love them! Well these are great! I’ve never tried D’s natural :O Must be my new mission! YES you will obsess! Thanks Rebecca! OMG ME TOO. I’m totally DEAD today! You need to try the fluff butter girl, legit just order 3 jars of it! Thank you!! I love a good energy ball! Oh, how good do these look! And healthy-gimme!! Yeah for health! Thanks Naomi! 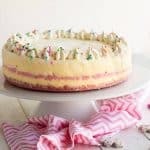 These look amazing and I can’t believe that there are only 4 ingredients! Such a great combination of flavors. 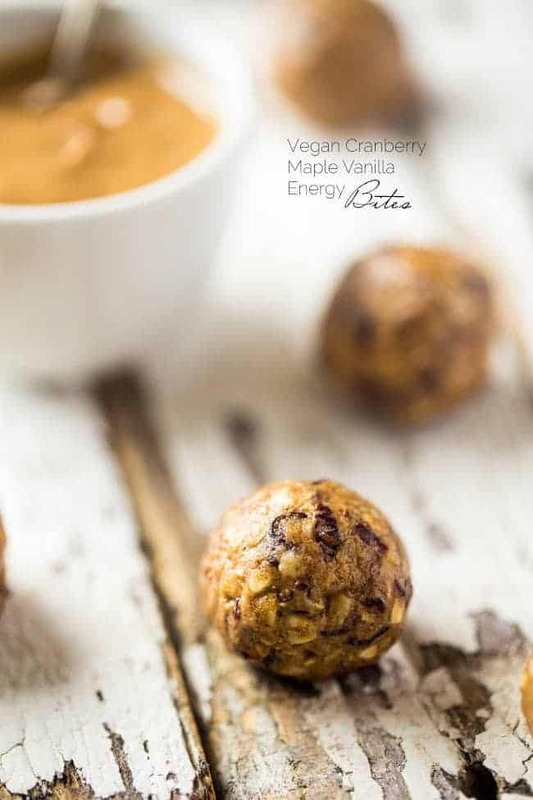 Mmmm… I feel like I would be starting my day with dessert with these little energy bites, but they’re so healthy! They’re so festive and they’d be perfect for tucking in my purse to take on the craziness of Black Friday shopping in a few weeks! Hey, I am all about healthy dessert for breakfast…nothing to complain about here! I forgot about Black Friday! YES! SO SOON! Thanks Rachel! Holy protein power! 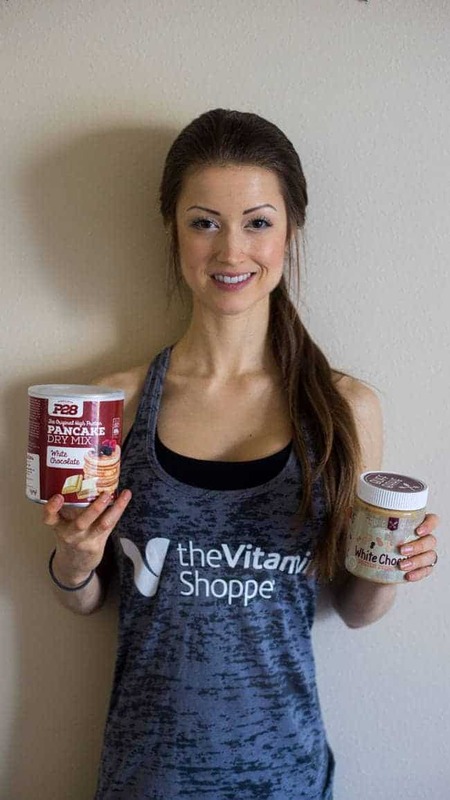 I’m heading to Vitamin Shoppe this weekend to see which ones are dairy free – please say the snickerdoodle one is! And those snack bites look AMAZING Taylor, but everything you make does. I wish I could tell you snickerdoodle is! 🙁 BUT the Maple Almond Fluffbutter is!!! Thank you so much Alisa! Awww you are just WAY TO SWEET lady, you made my day! Thank you heaps! Oh man these sounds soo good. THAT ALMOND BUTTER. I think I just bought about 4 different kinds of nut butter on vitacost the other day… oops? Haha I JUST DID THE SAME THING. Just online. I literally have like 8 kinds. OBSESSED. Thanks lady! 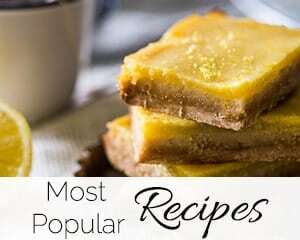 Your recipe looks delicious and it being healthy is just a plus for me. 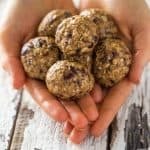 Will give this recipe a try instead of buying those questionable granola bars from the store, why not make your energy snacks yourself? Thank you.